A Kyser capo in gold. Kyser 'quick change' capos are the world's preferred capo. Today at the Grocery Store. Yesterday I'd turned in a job application at David's , in Kaufman, Texas; it's the smaller of the two grocery stores in Town. Today, my Mother and I went back to fetch some groceries. Yes, we use words like "fetch," in reference to groceries. . .but not on the internet or anything. That might be embarrassing. So, like I was saying-we were at the grocery store, and I applied for a job. Yes, I'm a very experienced HVAC service guy. You have to understand that this is the beautiful time of the year in north east Texas, and nobody needs me. I'd be lying to say that I don't enjoy a break from that stuff. This time of year, the break is provided, the plethora of oak trees, the elms, the imported pines, the pecan trees-it's beautiful, and the temperature is very mild. Facts are, all you need is a light jacket during the day, and a warm blanket at night. At the grocery store my Mother spotted a very elderly woman, and it turns out(no surprise for me) that she knew her. The elderly woman went on and on and on about how wonderful one of her grandchildren was, and that granddaughter was someone I had went to school with. I reminisced with a sigh how in my youth I'd discovered that half the attractive women in this town. . .were relatives. She's got a job working for Mr. Kyser. This is how this hub about the Kyser capo company was born-but not really. Kyser capos are made in Kaufman, Texas. I've played the guitar, more specifically, the acoustic guitar , since I was twelve years old. I already owned a Kyser capo, and a few other capos; and I'd laid eyes on perhaps a million and one half Kyser capos before that Christmas get together with the family. I knew that cousin Kelley, who was married to John, was an accountant. I knew that John was also an accountant. What I didn't know was that John dealt with the Kyser Capo company, and I had no idea that that company was located just outside of Kaufman. For all intents and practical purposes. . . it's a company out of Kaufman, Texas. My head sort of exploded at the newfound knowledge that the world's best known, most used, and most loved capo was a hometown product. I found this out when John started handing out capos to the family of appreciative amateur musicians. 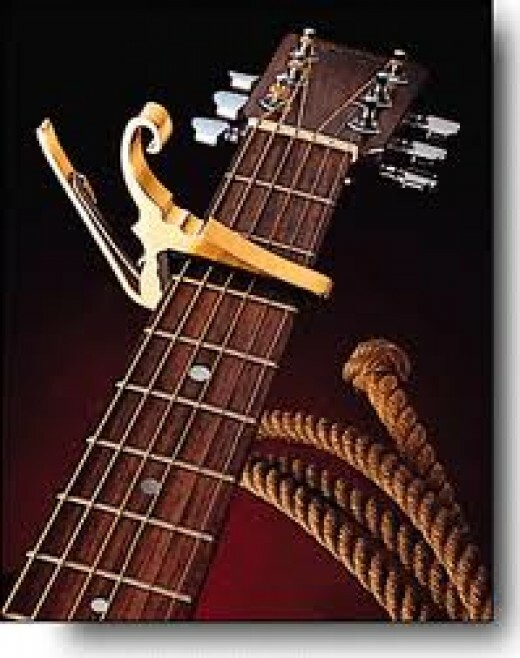 Should you be a stringed instrument aficionado such as myself-then the Kyser capo needs no introduction or description. It isn't the fanciest capo on the market, it's probably one of the least expensive that you can buy. The Kyser Capo is, however, very durable. If you ever needed to buy another one. . . then you just wanted a different color Kyser capo than the one that you already had, or you lost your Kyser capo, and need a replacement. The thing will never wear out. The Kyser capo is indeed the best known capo in the entire world. It's the easiest capo to use out of the million and three quarter capos that I've seen and laid hands on, and you're doing yourself a disservice should you be overly attached to that capo that that other brand failed to make as sturdy or convenient as the Kyser model. The people of Texas, and more specifically, Kaufman, Texas-are full of ingenuity, surprises, and outright genius based on simplicity. Contrary to what might be a common notion, the Gibson F-4 mandolin was not designed by Lloyd Loar, the luthier that designed the more widely known F-5, but rather, the F-4 was designed by Orville Gibson himself, the founder of the great Gibson Guitar Company. The Gibson F-4 was radical, and nothing quite like it had ever been seen before when it debuted on the market in 1909 - it was the Gibson flagship instrument. What was so radical about the Gibson F-4 mandolin? Well, just look at it. Before the Gibson F-4 was introduced to the world, mandolins just didn't look like that. Before the Gibson F-4, mandolins were basically a very plain looking instrument with an oval shaped body. They were so very plain looking that the pre Gibson F-4 mandolins of the world were often referred to simply as "taterbugs." 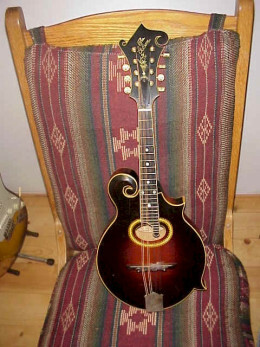 A 1921 Gibson F-4 Mandolin. Orville Gibson And Mandolin Innovation. Orville Gibson had studied Cremona violins, and he decided that his Gibson mandolins should be made to mimic the Cremona violins, and indeed, be even more beautiful to both the eye and the ear,if possible.Orville Gibson wanted to create legendary instruments that would last in style and in individual instruments - far beyond his lifetime, and that is exactly what he managed to accomplish. If you do not know, then the mandolin is a very similar instrument to the violin or "fiddle." The mandolin is only set up with eight strings in comparison to the violin's four strings. Playing the mandolin is only a thing different in that it is done with a pick instead of a bow, and thus the frets on the finger board, and also, rather than as with picking a guitar, the mandolin is set up for never hitting less than TWO strings at any given time with a plectrum. Do you see all the intricate curves on these Gibson F-4 mandolins? Before this instrument was created, there was NOTHING remotely so intricate in the world of mandolins. The musicians of the mandolin surely fell for these instantly. 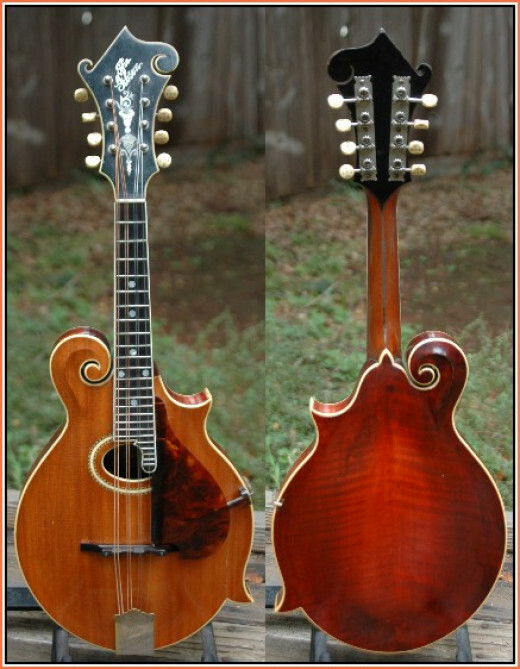 Oh I'd suspect some folks couldn't take to the design at first, but you can bet that soon enough everyone that made mandolins took proper notice, and realized that their skills were going to have to improve vastly in order to compete with the wiles of Orville Gibson. Shaping a tone wood into all these scrolls and sharp points in such a precision way as is clearly evident on the Gibson F-4 mandolin, that is no small matter, isn't done easily, and can't be expected to be had by any consumer for cheap, and neither should it be. This instrument is not only for making fine works of art, it is a work of art in and of itself. Though the F-4 mandolin was the pride of Gibson after its debut, it was a special order instrument, and it was available from 1909 up until 1943. Initially the F-4 was finished in black, gold top finish was available, and towards the end of this fine masterwork's run, a deep red had become the standard finish. The tops or sound boards of these mandolins are, of course, carved spruce, but the back and sides of any specific one might be either maple, or birch. Today both old time folk or bluegrass musicians and classical mandolin players both appreciate this work of art for the otherworldly sweet tone and, of course, its inherent beauty. Buckle up, if you wish to purchase one of these very rare mandolins, they aren't inexpensive, but when compared to the Lloyd Loar F-5s, are a bargain. The new Black Ice mandolin from Weber is a terrific traditional F style mandolin with a new and beautiful color scheme. Once you see the beauty of the Black Ice Mandolin from Weber, you'll agree! Weber musical instruments are well known both far and wide to be high quality musical instruments built by hand. Led by Bruce Weber, Weber instruments are all constructed by dedicated craftsmen who take huge amounts of pride in providing the world with terrific musical instruments built to last many lifetimes if cared for properly. Formed in 1997, Weber brand instruments are very new, but quickly gaining ground in the minds of all musicians and music lovers. All one has to do is handle one, or hear one being played by any musician - and the respect and admiration comes automatically from there. 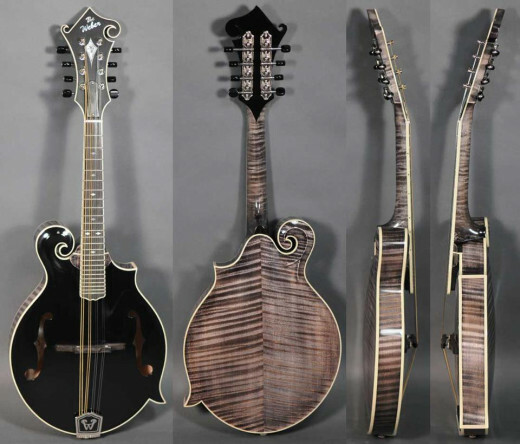 Here we are going to take a look at what is a very hot item, the Weber Black Ice Mandolin, and despite me only being able to locate these mandolins in the F style, it is rumoured that Weber also produces them in the A style of mandolin construction. Mandolins, mandolas, mandocellos, Irish bouzouki - and guitars too, Weber makes them, and makes them very very well. But lets take a look at this F style Black Ice mandolin! Brand new this year from one of the world's premier manufacturers of fine mandolins, Weber Mandolins has offered the world their absolutely beautiful black Ice mandolin. Without question, the black Ice mandolin is one of the most stunningly unique visual and musical entities in existence. The artistry of the builders and the tonality in the hands of the virtuoso surely will leave those with the gifts of enjoying both sights and sounds in awe time and time again. So just what is the Weber Black Ice Mandolin? Really, the Weber Black Ice Mandolin pictured directly below is a very traditional F style mandolin, and it is, of course, based upon the legendary Gibson F5 mandolin design. Weber Mandolins also offers the black Ice colour scheme and stylings in other styles. The top wood used is hand graduated and tuned solid spruce. The traditional F hole sound holes are readily evident per visuals, and the stunningly gorgeous back and sides are AAA grade flamed maple, which means this is going to be a very loud and bright sounding mandolin. Fingerboard and peghead are both of ivory bound ebony, and MOP diamonds serve proudly as the gorgeous fretboard markers. Let us be frank here, folks, the star of this mandolin show is the colour scheme of the instrument. The top is solid black while the sides, neck and back are translucent slate finish – one of the most memorable as has ever been seen, and the finish is glossy nitro-cellulose lacquer. Its hardware includes a black, cast “Weber” nickel-plated tailpiece and black plated Grover tuners; the bridge is traditional Brekke. It comes in a deluxe hard shell case and carries with it, to the first owner, a Limited Lifetime Warranty. For about five thousand dollars, you can purchase a Weber Black Ice F Style Mandolin that has never been owned. They are lovely, and they are the talk of any mandolin town you visit just about right now.